﻿"Attention to detail is key in every beauty aspect. I pay attention to every detail when coming up with a look. From choosing a new hair color to choosing the right beauty style for your wedding day, its about playing up all your strengths. Having an eye for detail pulls everything together for your finishing look. I strive on being artistic and creative. All while still keeping the feeling of you, when looking in a mirror. " contact for more INFORMATION . 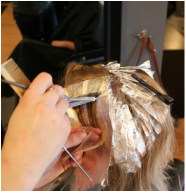 Salon services in highlights and balayage hair color, hair cutting, keratin treatment, and hair extensions. ​edge. Event styling is one of her many specialties. service, please go to the contact page.